You know the idea that everybody in this world is a mere six or fewer steps away from each other. For Fritz Peterson, a former Mount Prospect resident, ex-New York Yankees pitcher and Northern Illinois University Athletics Hall of Famer, those distances might be less, considering all the people he has touched in his lifetime. Now living in Iowa, the 76-year-old Peterson was diagnosed with Alzheimer’s last September. While working with doctors at the Mayo Clinic in Minnesota, he is currently bedridden, cannot drive, and will not make the Yankees’ Old-Timers’ Day on June 25. When I heard that Fritz had revealed his sad news to the New York media, I quickly called George Bork. All three of us are Mount Prospect boys. Peterson and Bork were joined at the hip for their first two decades. They played on the same Mount Prospect Little League all-star squad, shared a birth date (Feb. 8, 1942), and grew up five blocks apart on the north side of the tracks. Fritz’s dad, Fred, coached and ran the 1950s park district baseball programs. “Yeah, Fritz got a head start on all of us,” recalled Bork, who pitched and played shortstop, in addition to starring in football and basketball at AHS. Being six years younger and becoming more cognizant of hometown athletes, reading about Peterson and Bork in their Huskie prime in my years at Prospect High may have “subliminally” recruited me to NIU. I am forever in their debt. Career opportunities separated them. After his junior year in 1963 at NIU, Peterson signed with the Yankees and rose through the New York farm system before making the Bronx Bombers in 1966. Meanwhile, after leading the Huskies to a 10-0 season, the College Division national championship, and a Mineral Water Bowl victory, Bork forsook his senior basketball season and signed with the Canadian Football League Montreal Alouettes in 1964. Enter another NIU Hall of Famer, basketball-baseball standout Roger Dutton. “My first year at NIU was Fritz’s first in the Yankee system. And my first year in the Yankee organization was Fritz’s first in the big leagues,” recalled Dutton, a third-round pick in the 1966 draft. An outfielder, Dutton reached the Triple-A level before a career-ending injury in 1968. Peterson enjoyed an 11-year career with the Yankees (1966-74), Cleveland Indians (1974-76), and Texas Rangers (1976). Known as a crafty southpaw with pinpoint control, he finished with a 133-131 career record, a 3.30 ERA, plus a 1,015-to-426 strikeout-to-walk ratio in 355 games and 2,218 ? innings. Career highlights include a 20-win campaign and an All-Star Game appearance in 1970. According to the Elias Sports Bureau, he holds the lowest career ERA of any Yankee hurler in the original Yankee Stadium. 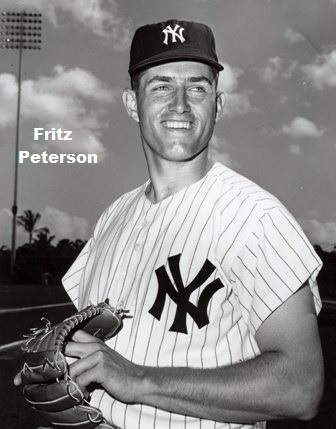 When Jim Bouton, a one-time Yankee roomie, wrote his controversial baseball book, Ball Four, Fritz might have been the only teammate not to get ripped in print. Enter Rick Cerrone, former Yankee PR chief and editor-in-chief of Baseball Digest. Yes, I have not mentioned Peterson’s infamous wife-swapping with teammate Mike Kekich in 1973. I’m acutely aware of it. Sadly, it might be the first thing mentioned in his eventual obituary. He is a born-again Christian part-time evangelist, and still married to Susanne Kekich. Fritz once said: “It’s a love story. It wasn’t anything dirty.” It’s his life. Besides, us Mount Prospect boys stick together. • Mike Korcek is a former Northern Illinois University sports information director and member of the NIU Athletics Hall of Fame and Northern Star Alumni Hall of Fame. He also is a member of Prospect High School’s Distinguished Alumni.